Autism in France: why France is 40 years behind the rest of the world. Why we’re 40 years behind. Following a recent article in SpectrumNews, there’s been some discussion regarding the situation of autism in France. But both the article and many of the responses suffer from inaccuracies and misconceptions, and as someone who’s autistic and has lived in France for many years, I thought I’d try and fill in the dots. Though as with all things French, it’s complex. The image many outsiders have of autism in France is that there’s a battle between supporters and opponents of a view of autism as a psychosis or psychopathology, in short, a battle between psychoanalysts and the rest. But it’s not. In France, the debate isn’t about whether or not autists are dysfunctional or damaged, it’s only about who gets to fix them. It’s true that the influence of psychoanalytic doctrines continues to do an enormous amount of harm to autists and their families here. Lacan and Freud have a lot to answer for. But these views aren’t limited to the psychiatric or medical establishment, they permeate to the farthest reaches of the social, educational and legal systems. But when it comes to autism, this isn’t the only or even the biggest problem. The biggest problem in France is cultural. So let’s start with culture. In fact, let’s start with mottos, the kind of thing that your football team or your school has. You may even have one on a family crest, something uplifting in Latin inscribed on a plaque you bought from a heraldic shop which now languishes in a box in the garage. France has a motto: Liberté, égalité, fraternité. But in France, those three words aren’t just something that goes on your school blazer, they go to the very heart of Frenchness itself. And why not: freedom, equality, fraternity are right up there with peace, love and understanding as principals to live your life by. Let’s look at the second of those, equality. On the surface at least, hard to see how it could be problematic. After all, surely what autists want is to be accepted as equal-to rather than lesser-than? “The French republican model has traditionally been regarded as the ideal of inclusivity. However, in practice, this amounts to confronting minorities with highly assimilationist demands in terms of language and cultural mores and refuses public recognition of cultural diversity.” (Asari et al.) Throughout French culture, Liberté, EGALITE, Fraternité is used as a hammer to enforce homogeneity and suppress difference, diversity, and even exceptionalism. It leads to a game of Whac-a-mole: any minorities or sub-cultures that dare poke their heads above the parapet are quickly bashed back down. Some examples: French, and only French, is the official language of France. Minority native languages such as Breton or Basque have no official national status, and as recently as 2015, the French Senate rejected a law ratifying the European Charter for Regional or Minority Languages. Back in the day, President Chirac said that he was opposed to giving « special rights to organised linguistic communities”. Substitute “linguistic” in that phrase with ANY minority or identity-based community and you get the picture. And this isn’t an isolated case. France is the only major country in Europe that hasn’t ratified the Framework Convention for the Protection of National Minorities. One of the consequences is that there is no Council of Europe monitoring of minority rights in France. Here’s what happens. Say, for example, you’re an Afro-feminist group who wants to organise a series of conferences for women of African descent and only for women of African descent. You’ll have the (female and socialist) mayor of Paris telling you that you can’t use any public venues and find yourself roundly attacked from all sides of the political and social spectrum for your “communautarisme”. And no, as with the linguistic example above, this isn’t an isolated case. The same fate awaits anyone looking to further the cause of any minority group, or even to recognise their existence. For example, as with any of the identity or culture-based fields of research, queer/LGBT studies is non-existent in France. When Marie-Hélène / Sam Bourcier attempted to introduce a Masters in Queer Studies at the University of Lille “I was treated as a communautariste rebel.” Needless to say, the course didn’t eventuate, nor have any similar courses, even though they’ve been available elsewhere since the seventies. As Jérôme Courduriès of the University of Toulouse noted on the possibility of introducing LGBT studies: “While it might be possible in the U.K., in France it’s just science fiction.” We’ll come back to disability studies later, but no, it doesn’t exist here either, nor does the idea of intersectionality. But these ideas aren’t limited to the hallowed halls of French administrative or academic institutions. They permeate French culture, and that includes autistic culture. I once found myself in conversation with someone on the autistic spectrum who was organising a conference and was met with horrified looks and “mais non!” when I asked why there couldn’t be only autistic speakers. In his report on the employment situation of autists in France, Josef Schovanec pointed out that you couldn’t propose an initiative such as “autism hours” in supermarkets without getting into a debate about communautarisme. 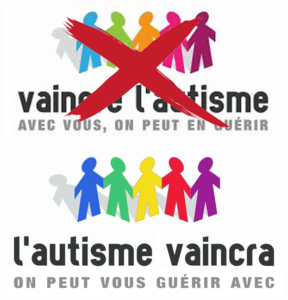 In response to this pressure to not appear “communautariste”, what passes for autistic/autism advocacy in France would be unrecognisable as such elsewhere. As the sociologist Brigitte Chamak sums up in regards to autism: “If in Anglo-Saxon countries groups organise themselves into social movements that challenge normative principles, in France we focus on defending the interests of people with autism and their families.” Autism advocacy in France means lobbying your MP for ABA therapy to be covered by the National Health program, or organising a charity event so that the local autistic day-care centre can buy a trampoline. Chamak concludes that “the historical and cultural context and in particular the opposition to communitarianism are unfavourable to the development of radical demands”, though for me, that’s an understatement. You would never find a member of the French administration, or even an autism support and advocacy group, talking about the need to “empower” autists, as a member of the Spanish Health Ministry did at the recent ASDEU Conference. In a similar vein, presumably there’s a French phrase for “autistic-led”, but I’ve never heard it. So forget autists as a part of the population with their own identity and culture, and forget about advocating for that identity. And on an individual level, with the attitudes that exist, forget about even having an autistic identity in the first place. Jeanette Purkis remarked, “I had to fight hard for my autistic identity.” Imagine how much harder that is when the very notion of autistic identity is questioned, if not denied outright. This is a major impediment for French autists in undertaking the journey to self-acceptance and an autistic selfhood and only adds to the challenges that autists here face as kids growing up or as adults pre/post-diagnosis. In France, autists don’t get to exist – not as autists in any case. Whether or not you see autism as a disability or a difference – or both simultaneously, a kind of autistic Schrödinger’s Cat – all autists will at times experience disablement as a result of living in a non-autistic world. (For more on this, I’d recommend Oolong’s Article as a starting point.) Accordingly, we can take models of disability as a useful framework for exploring attitudes to autism in France. In fact, the model that’s most common here isn’t just the medical model, it’s a development of it, the charity model. This further incorporates elements of the religious model, France being a strongly Catholic country – though so are Italy and Spain, and they are leagues ahead of France in terms of understanding and accepting autism. What these charity/religious models say is that yes, you’re different and damaged (the medical model) but don’t worry, we have a moral/religious obligation to take care of you. This means either institutionalisation or therapy with behavioural therapies (ABA) or treatment with antipsychotic drugs. Almost nowhere in France is there recognition of the collective role society itself plays in disabling autists. For example, France has an appalling record of access of autistic children to mainstream education. As lawyer and autistic advocate Sophie Janois remarked: “we never stop demanding that autistic children adapt to the classroom, but never that the classroom adapts to the autistic child”. So when it comes to whether or not teachers should modify their teaching approach or make adjustments in the classroom’s sensory environment, let alone whether the other students should be guided in how to adapt their behaviour to better accommodate an autistic classmate … bien sûr que non! Not only does the solution rest in the autistic child themselves (medical model), we come up against le communautarisme again, i.e., we make no exceptions for those who are different. And it’s not just autists, take deaf children: sign language was banned in the French education system until 1991. – Research into autism is either bio-medical/genetic or looks at treatments and therapies such as ABA, though even here, research lags behind: at Autism Europe’s 2016 conference, there wasn’t a single paper presented by a French researcher, and French researchers are conspicuously absent at such events. There is virtually zero research into autists’ well-being, or in fields such as education, employment or sociology, let alone exploration of the nature of autism itself such as autism theory and autism as a construct. The latter is particularly striking in a culture that prides itself on the central place that it accords to philosophy. The image of French intellectuals in black turtle-neck sweaters sitting round Les Deux Magots smoking Gauloises and debating whether God exists is a cliché but isn’t entirely wide of the mark. But given the situating of autism in the medical model, French philosophers would pay no more attention to the ontological status of autism than they would to the common cold. – Disability studies as a field is non-existent because if disability is a medical condition, then study of disability is an affair for medical professionals: doctors, psychiatrists, neuroscientists etc. Wikipedia is as good a guide as any as to how a culture sees itself: there’s no entry in the French Wiki for Disability Studies. None. On the other hand, there is a small one for the social model of disability, but it notes that it’s an approach that was developed in the US/UK – in other words, it’s an invention of les anglo-saxons and doesn’t apply to us. With no disability studies, there’s no real discourse around disability and thus no real vocabulary: not only do we not talk about disability, we don’t even know how to talk about it, at least outside of the medical model. For example, in researching this document, I came across a site in French explaining the various models of disability – every reference they cited was non-French (and in English, more of which later on). Also re disability studies, see above re le communautarisme. – Because of the medical model, expertise on autism is located exclusively with medical professionals, the same way it would be for leukaemia or diabetes. As such, autists are not seen as credible authorities or points of reference on their own condition/identity, even by the majority of the parents’ associations. The witty and brilliant Josef Schovanec with his PhD in philosophy and multiple languages and the nearest France has to an emblematic figure like Temple Grandin, comments ironically in the introduction to his French translation of Stephen Shore’s “Autism for Dummies” (Autisme Pour Les Nuls): “What a shock it must be for a French reader to be holding in their hands a book on autism written not by an “expert” but by someone who is actually autistic.” Though when it comes to autism in France, irony abounds. I recently received notice of a conference on inclusion for autists which doesn’t include a single autistic speaker, the paradox of which seems to have escaped the organisers. – Because of the above, medical professionals become gatekeepers to expertise and information, and even to autism itself. This, coupled with the widespread ignorance and misunderstanding of autism amongst these same “experts”, means that many autists, especially adults, are still being discouraged from pursuing a diagnosis, often on the most spurious of grounds. These range from “you can’t be autistic because you have a child” to one of the best I’ve heard, “you can’t be autistic because you work in retail”. Further – though see the above re communautarisme – self-identifying as autistic without an “official” diagnosis is not recognised or accepted in France, even amongst the autistic community, and within the diagnostic process itself, the lived experience of the autistic “patient” themselves is often ignored or marginalised. – The medical model is based on cure and treatment, we treat what we see, i.e. the visible behaviours. So in France, autism is widely perceived as behavioural rather than neurological or cognitive. There is little or no thought given to what’s going on behind these behaviours, or of understanding them as responses to typically human feelings of happiness, fear, confusion etc. You would never find anyone in France quoting Barry Prizant’s “There is no such thing as autistic behaviour. These are all human behaviours and human responses.” This vision also means that there’s little recognition of autism as something that goes on inside your head. For example, perseveration is rarely mentioned in connection with autism here, even though it features as part of the diagnostic criteria. – The medical model “creates a culture of charity, since society can choose to support the person or not”. This gets back to what I touched on above re advocacy and leads to well-intentioned activists advocating for autistics in the same way they would for patients with terminal cancer: better treatment, treatment with respect, more facilities, funds for research etc. However, these same people still generally see autism as a deficiency that needs a cure and autists as people who need normalising. There is little or no advocacy based on the social model, or (e.g.) for the acceptance of autism as a variation in functioning rather than a disorder to be cured. Culture also means language, as language shapes how we understand our world, which includes how we shape our understanding of autism. In this regard, le français has a lot to answer for. French is a language with fewer words than English, though the only French person who ever acknowledged that to me without prompting was Hugo Horiot, who’s on the spectrum. Of course, there are still more than enough words to go round, so that difference won’t stop you going down to your local boulangerie and buying a baguette, nor even writing a novel about going down to your local boulangerie to buy a baguette. But it does mean that you approach speaking French differently to a language like English. For starters, you often find that you need more words to say the same thing, as anyone who’s ever had to grapple with bilingual English/French page layout will confirm. But it also means that for some ideas, vocabulary is limited and this is where things start to get problematic. Handicap/le handicap: there are two problems straight away. The first is that this is a word that in French is ONLY used in this context, so we lose the wider, benign sense, e.g. handicap in a competition or race. We also lose the verbal sense of handicap, i.e., that handicap is not just a thing, but it’s something that you do or is done. The verb “to handicap” apparently exists in French, but I’ve never come across “je handicape” or “vous handicapez” etc. This is problematic enough when we use le handicap for handicap, but is even more so when we use le handicap as a translation of disability. After all, the whole point of the social model is that a disability is not necessarily a handicap. But in French, disability is by definition ALWAYS a handicap, these aren’t two separate notions. Further, as with handicap, we also lose the wider sense of the root word, i.e. to switch off or deactivate as in “Disable the force field Dr. Spock.” French actually has a word for this sense of disable: “désactiver”, but in France, someone with a disability is not désactivé, they’re handicapé. So we lose the sense of “disable” as something that you do, or in this case, that is done to you. In French, disabled (= le handicap) is something that you are, society and the environment have nothing to do with it. It’s true that some French disability advocates who are up to speed on the social model have started using the phrase “en situation de handicap”, which does kind of get around the problem, even if it takes 4 words to do so and still doesn’t differentiate between disability and handicap. However, it’s not a phrase in widespread use. For example, the French version of the U.N. Convention on Disability Rights uses le handicap/handicapé throughout. “en situation de handicap” doesn’t appear at all, even though it’s much closer to the intent of the original document. Impairment? I ran this through a handful of English-French translators – around half gave “handicap”, which brings us back to the same issues we’ve just looked at, in particular, that an impairment is not always a handicap. The other word that often comes up is: “déficience”. But there’s a gulf between deficiency with its normative notions of “you’re missing something” and the idea of impairment as an atypicality or a deviation from typical functioning. In reality, ALL French vocabulary relating to autism is rooted in the medical model and/or a medical, pathologising terminology. Imagine you’re on the autistic spectrum and to help regulate stress or simply because it feels good, you flap your hands. Flapping is what flags do in the wind, or birds do when they move their wings up and down. The term is simply descriptive and without any real value judgement. Not so in French. This behaviour/movement when it applies to someone on the spectrum would be referred to generally as une stéréotypie, or even more pejoratively, une bizarrerie, which needs no translation. The other word we find in French for this kind of behaviour is … le flapping, a term borrowed from English (we’re seeing a theme here) which is NOT used to refer to birds or flags and is reserved specifically for autists. So once again, we have a word that’s robbed of its general, benign sense, and is only used in relation to autism. In France, while we fall over ourselves to normalise autists through therapy and treatment, the language does the opposite, going out of its way to abnormalise us. By giving autism its own specific vocabulary distinct from everyday speech, we separate autists from the rest of the population. Language does what we once did with lepers. This also brings us back to the social model again, where people are taken to be disadvantaged and excluded not just by physical barriers but by attitudinal ones, which includes by definition, language. It’s difficult to discuss autism in France in neutral terms, it’s either pejorative or framed within the medical model. As well as the terms we’ve touched on above, you’ll often come across pathologising expressions such as “souffrent d’autisme” (suffering from …) “vivant avec …” (living with …), and a phrase which is particularly common, “atteint d’autisme”, (afflicted or affected by …). Other terms from the medical lexicon such as “maladie” (sickness), “pathologie”, “symptomes” and “morbidité” are widespread, as are functioning labels: “autisme de haut/bas niveau”. (high/low level autism). Finally, just to mention the use of person-first language. There’s a get-out-of-jail free card here, because in French grammar the noun always precedes the adjective: maison bleu, chien noir, trampoline rond. Thus an “autistic person” is always a “personne autiste”. However, that doesn’t stop widespread use of “personne avec autisme” (person with autism), without any recognition whatsoever that it’s a term that could be problematic. Apart from these stigmatising and medicalising issues, the other main problem with everyone speaking French is that they don’t speak English. Not a problem per se of course, you can still buy your baguette and write your novel, but a problem in having access to a wider, international discourse that’s carried out predominantly in English. While there are important books on autism available in French: Grandin, Bogdashina, Vermeulen, Attwood, Donna Williams etc., the field is notable for the huge number of books that are NOT available. In that basket, and conspicuously absent in French is Steve Silberman’s Neurotribes, in spite of attempts by a number of people here to find a publisher willing to take it on. But this is just the tip of the iceberg. For example, none of the recent books from Damian Milton, Nicholas Chown or Luke Beardon are available in French, and it’s hard to see Melanie Yergeau’s new book – looking at autism and identity from the point of view of neurological queerness – not suffering the same fate. The other problem is of course that the vast majority of academic publications are only available in English. So while many people in the field of autism here could talk to you about, say, Simon Baron-Cohen’s 1985 study on theory of mind which is available in French, very few seem aware of papers or studies that contest its validity, at least in the form that SBC proposed. There are French versions of both Kanner’s and Asperger’s original papers, but most studies available in French are biomedical or genetic and situate autism in a deficiency/pathology paradigm. Further, there’s pretty well zero awareness of what I think of as the Nouvelle Vague of autism research, much of it involving autistic researchers and commentators. For example, Damian Milton’s important paper on the Double Empathy Problem was published in 2012, but I would be surprised if you could find a single person in France who’s aware of it. It’s not so much the absence of these specific texts which is problematic, it’s the absence of any discourse around the ideas that they explore. In France, ideas such as “autists lack empathy”, “autists are deficient in central coherence”, “autism is defined by a triumvirate of deficiencies” are taken as gospel truth, and like much gospel truth, engraved in stone. Not only is their validity rarely questioned, there’s often no awareness that that validity has been questioned. One idea that has particularly suffered is the modelling of autism through the neurodiversity paradigm. The absence of any substantial texts in French (Neurotribes for starters) plus the usual French wariness of ideas that are perceived to come from les anglo-saxons, has led to a fairly hostile reception. In particular, in some commentaries there has been a (deliberate?) mistranslation of the word “cure” (guérison) as “treatment” (soins). So one of the guiding principles of neurodiversity, that autism isn’t a pathology and thus autism itself doesn’t require medical intervention, has been misrepresented to portray neurodiversity as a kind of politico-social movement whose rallying call is “no treatment for autists”. And as soon as that happens, French anti-communautarisme rears its head. We’re a long long way from neurodiversity as a model for public policy, such as the British Labour Party’s proposed “Neurodiverse Manifesto”. Before moving on from language, one caveat: there is a certain amount of decent information available in French, often through French Canadian sources (e.g. Autcreatifs). But widespread awareness of this body of information in France itself is limited. Having said all that, there are some good people in France, including amongst those who aren’t on the autistic spectrum. There are even many here who accept that when it comes to autism, France is indeed 40 or 50 years behind. However, from what I can see, very very few of them really grasp the full ramifications (and that includes a sizeable percentage of the autistic population itself). It’s a kind of autism Dunning-Kruger, where people are largely unaware of just how deficient their understanding is. Crucially, I don’t believe that (m)any of those engaged with autism understand that for all their good intentions, they’re seeing autism through the perspective of the medical model and that what passes for help and aid is geared around normalisation. Very few people in France would challenge the beliefs that autistic children need to be shoehorned into typical developmental paths, that any other paths are failures, and that the goal of treatment is the acquiring of neurotypical social skills. I don’t believe that anyone here would praise an autistic child for reaching an autistic developmental milestone such as learning to self-regulate through stimming – or even be remotely aware that they should or could. Of course, I’m not suggesting that outside of France everything is hunky dory, nothing could be further from the truth. But there’s a fundamental difference here. The fact that autism-as-psychopathology continues to flourish 50 odd years after everyone else moved on is not just down to ignorance. It’s because of attitudes in French culture itself that these harmful ideas continue to fester unchecked. Sure, things are changing, but much of it is a chimera, with an increased focus on the “rights” of the autistic population, where that means rights as defined by the medical model: rights to access treatment, to be treated with dignity, etc. But this misses some key points. Firstly that autists also have the right to NOT be treated for their autism: i.e. the right to live and thrive as they are, happy and fulfilled in their autistic selves. Secondly, that arguing for autists’ rights doesn’t stop you seeing autism as a mental condition, invisible illness etc. When a leading politician used “autistic” as an insult, drawing on Larousse’s figurative definition of the word as a “denial of reality that leads to self-isolation and refusal to communicate”, he was roundly condemned – not because he was wrong, but because he was impolite. I’ll leave you with a story that the mother of an autistic girl posted on Social Media recently. For all the world’s ills, I don’t know that this could have happened in too many other western countries. The child had been unwell and had become lethargic and dehydrated, so the mother took her to the emergency section of the local hospital. A doctor arrived, and the mother started listing the symptoms, going on to say that the girl was autistic. The doctor interrupted her with “I’ll just stop you there: we don’t treat autists.” (Je vous arrête, on ne soigne pas les autistes.) She was eventually able to find another doctor and get her daughter the care she needed. But … 2018?